Recently, Ross Coops wrote a guest post on Tom Murray's blog titled "The Problem with Prepackaged STEM Products." His point, summarized here by me in 135 Twitter-like characters, is this: "Prepackaged STEM products can distract us from developing teachers to have an inquiry mindset and change their instruction accordingly." Ross brings up some exquisite points about the dangers of shiny STEM things becoming the Siren's song: entrancing and preoccupying us, but eventually leaving us shipwrecked having less than what we began with. And that's accurate. A product is in no way a replacement for a change in pedagogy, a shift from traditional instruction to inquiry, or the introduction of messy, unrefined problems into our classrooms. On the other hand, I believe these products do have value when used correctly. 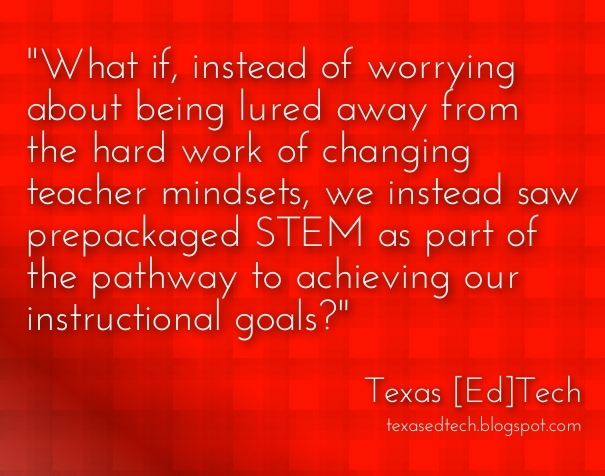 What if, instead of worrying about being lured away from the hard work of changing teacher mindsets, we instead saw prepackaged STEM as part of the pathway to achieving our instructional goals? Like the SAMR model, what if on our way to a redefinition of teacher practice, we saw that a willingness to start with "substitutional STEM," while not an end in itself, is a solid first step to helping teachers reach the higher levels of inquiry? 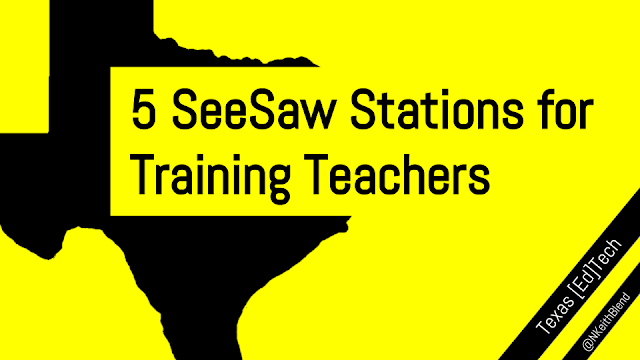 We make an error in logic if we consider this a zero-sum game: providing teachers with prepackaged tools is not mutually exclusive to developing their pedagogical ability. 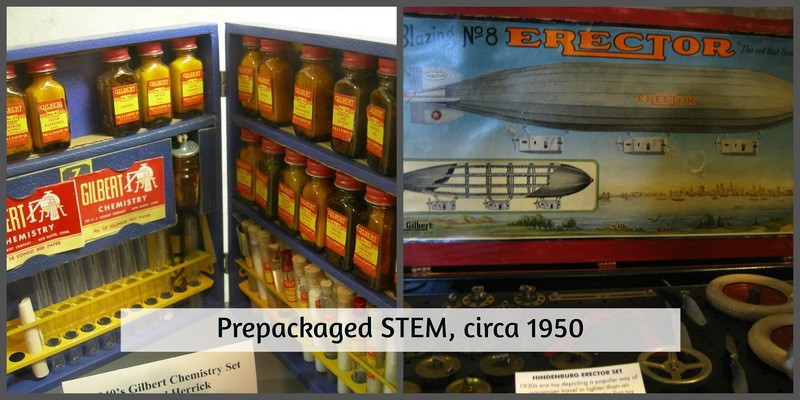 With the idea of using these tools as part of a teacher development pathway, here are my four thoughts in support of prepackaged STEM products. Prepackaged STEM products can provide the "training wheels" to get a teacher thinking differently about allowing students to tackle problems on their own. In his post, Ross asks the question "If you're a traditional teacher putting a prepackaged STEM product in front of your students, what are the chances the product's values -- prompting of problem solving, collaboration, critical thinking, etc. -- will then start to permeate the rest of your teaching?" If we look at prepackaged STEM as a scaffold in the teacher development process, then my response is "The chances are pretty good." If leaders in the school who are responsible for teacher development agree that the end goal is to develop facilitators of inquiry, then we should be probing, prompting and questioning teachers to reflect on how the values of the product could be transferred to their everyday instruction. No, the transfer won't happen automatically, but in the same way we activate prior knowledge with our students, we now have an "anchor experience" with which we can refer teachers back to as we move forward: "Remember that time the students got stuck programming their Sphero? Remember how you chose not to intervene and let them work it out on their own? How can you apply that same idea to letting them debug their geometric proof of the Pythagorean Theorem and its applications for architecture?" Whatever the STEM product is, it must serve to provide a successful experience that teachers can reflect on and realize that they helped to create an environment where problem solving, collaboration and critical thinking actually happened. And through a guided dissection of the experience, they can learn to do it again. Prepackaged STEM products can build teacher capacity by providing a model for the inquiry process. 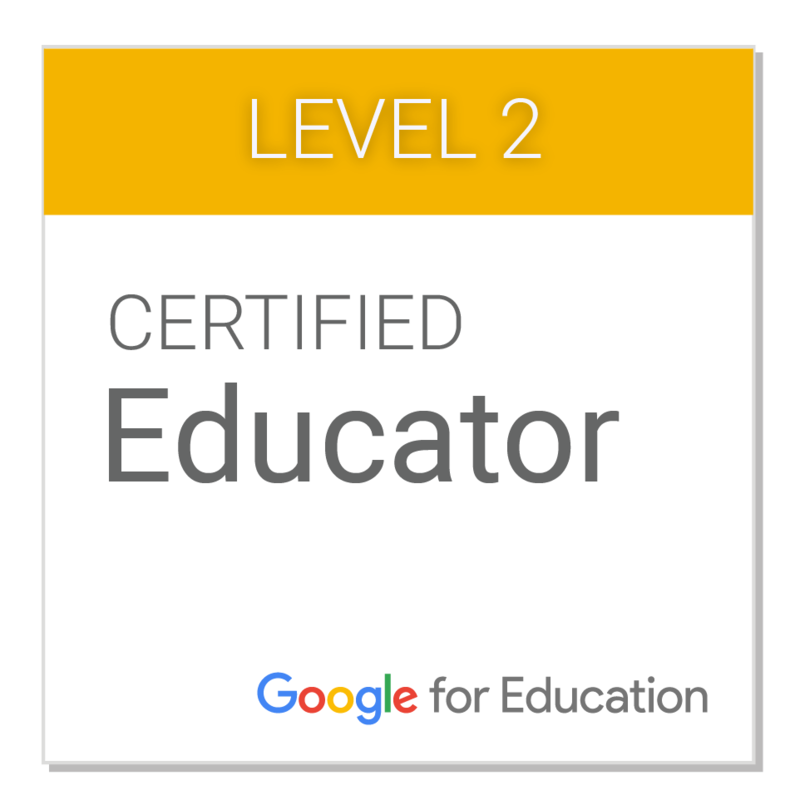 I taught for several years in a hands-on STEM lab devoted to giving students experience in 15 different STEM careers: robotics, web design, video production, electrical engineering, manufacturing and a bunch of other ones. Using a blended curriculum, the students were provided with "prepackaged" materials, and they were then given the opportunity to solve open-ended problems with them. As I watched students experience the different modules, interesting patterns begin to emerge. I noticed that there were points where students would become incredibly frustrated with the problem they were trying to solve, but I also noticed that if I left them alone, most got themselves unstuck. I began to learn when to prompt students to express what they were struggling with, knowing that if they said it out loud, they would typically recognize the solution themselves. I wouldn't have been able to discern these patterns without seeing the same script play out hundreds of times. What did that do for me as a teacher? When I introduced other, unscripted, "unpackaged" problems for students to solve, I knew to let them struggle. I knew when to step in. In other words, I learned how to facilitate inquiry through pattern recognition. Even though inquiry is a fundamentally messy process, it does have certain recognizable elements that teachers can plan for and coach students through. Seeing them in action countless times built my capacity to develop better, deeper, and more challenging learning experiences for my students. Not everyone equates a prepackaged STEM product with the "false illusion" of "powerful instructional shifts." I'll be the first to admit that I've seen schools and districts where the shiny things (whether its edtech, STEM products, or a new reading curriculum) become the end instead of the means. But there are many, many out there from the PBL, STEM, STEAM and MakerSpace tribes who know better. It would be a classic "baby with the bathwater" mistake to discard prepackaged STEM because some have used it as a substitute for true, powerful change. Obviously, handing a student a set of littleBits and a directions booklet does not equate to a sudden closing of the achievement gap or an abrupt realignment to equity in education. But what it can do is provide access to the tools a teacher needs to get students engaged, thinking differently, and exploring the world around them. Yes, a product is not a sea-change in instructional practice, but it can be a powerful tool to get us headed in a better direction. It's not the tool, it's what you do with it. 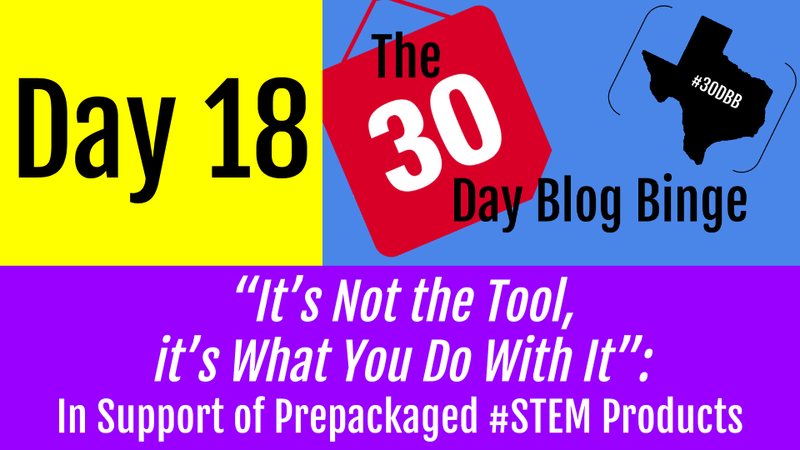 Ross questions in his post if prepackaged STEM products are "polished and overly contrived" and "ignore...problem solving, productive struggle, and [the] iterative process." Earlier, he mentions littleBits, Snap Circuits, and Spheros as examples of the prepackaged products he's referring to. The thing I see in common with these products is that they have parts and directions. With those as our defining characteristics, we could easily include Lego Mindstorms EV3, Makey Makey, rocketry kits, GoldiBlox, Scratch, Code.org, this Raspberry Pi starter set, Lab-Aids kits, and pretty much anything else that provides a bit of guidance in getting students started with a tool. Just because a product has items packaged together and includes a set of directions doesn't mean that it eliminates struggle and problem solving. Actually, the fact that students are initially given a goal to reach or a product to create requires them to become better problem solvers. Watching students work with Mindstorms robots to try and create their first program showed me that, no matter how detailed the directions might be, it's very rarely going to work correctly the first time. Students then have to figure out why. The problem is when exploration stops with the creation of the product in the directions. Once a product is created, it becomes the job of the teacher to push students to iterate, refine, and create outside the constraints of the steps that have been provided. Additionally, its important to think of endless scientists and engineers whose interest in their field started with receiving a chemistry set or erector kit in their childhood. Since they contain parts and directions, they could be considered the "prepackaged STEM products" of decades past. But they became an entry point for interaction with the world of STEM, a chance to wonder about why things worked the way they did. Coming as a set did nothing to lesson their effectiveness in cultivating a scientific mindset. Problem solving, productive struggle and the iterative process are hallmarks of an advanced thought process, not a product or curriculum. So as long the environment is ripe for students to go "off-book" with the STEM products, having an initial structure and directions can acquaint students with the tools, as well as their possibilities and constraints, which provides them with the fodder they need to use those tools in creative ways. 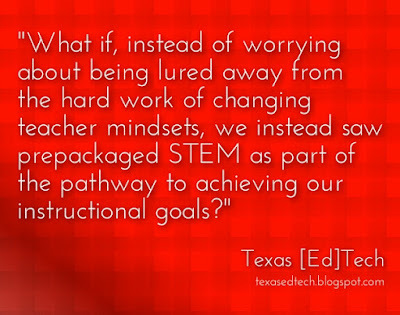 At the end of the day, it's our job (as the ones who know better), to preach systematic, purposeful integration of these STEM products into our goals for teacher growth and development. Ross makes a great point when he says "we must invest in our teachers through professional development, and by establishing cultures of ongoing learning and inquiry." Yes, we certainly must. Some teachers are already there, some teachers are working on it, and others need significant support. But all teachers and students can benefit from access to well-designed tools to spark students' imaginations and get them engaging with the lexicon of ideas that make up STEM.